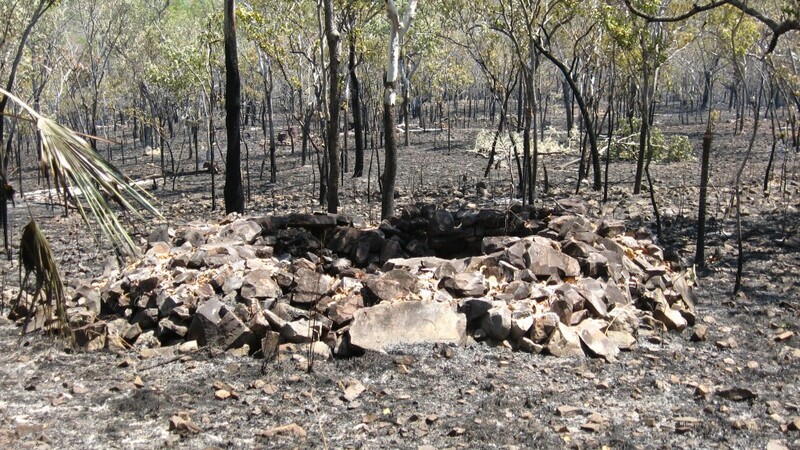 Apart from tent sites and slit trenches, the most frequent type of field fortifications that appear at WW2 sites across the Northern Territory are improvised Anti-Aircraft emplacements of both Heavy, Medium and Light classifications. Most of these emplacements are typically located in and around airfields and their supporting taxiways and revetments however some can also be found at other sites, such as at infantry, service, HQ, coast and fortress sites. Of these, most emplacements were constructed using a combination of 44 gallon drum ‘gabions’ and corrugated iron, however some were constructed from earth, stone, and even water tanks. This page attempts to present the many and varied types of AA emplacements in the NT and also examine their form and function. Before we examine these emplacements it is important to consider the doctrine which defined the construction of these emplacements. Although it is not known exactly which doctrine was used in the construction of these field fortifications, we can be sure that light AA emplacement construction was a combination of both US and Commonwealth principles. Indeed, light emplacements used a range of different styles and techniques of construction, relying on the material at hand, the type of weapon emplaced, the environment where it was constructed along with the past experiences of service personnel. With with medium (40mm) emplacements and 3.7 inch emplacements the photographic and material evidence suggests that US doctrine was to dominate the layout of same, with construction techniques being primarily that of commonwealth doctrine. 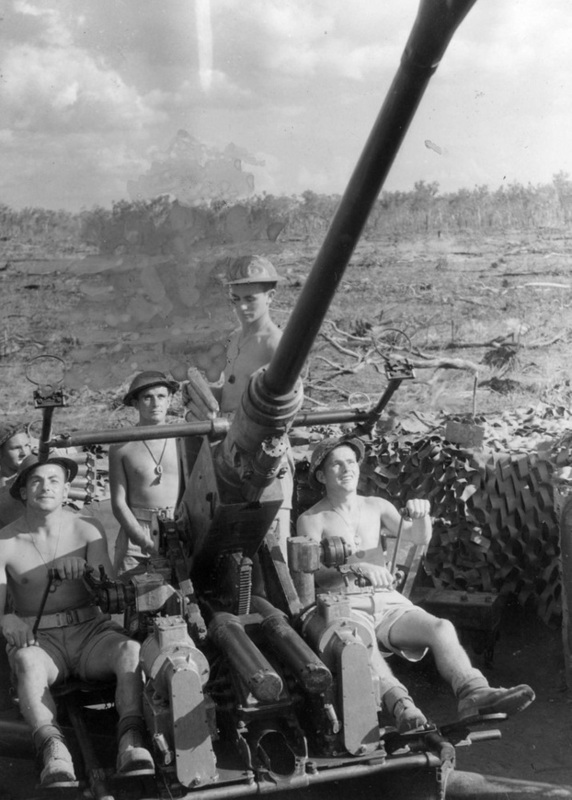 This prevalence of US doctrine in the layout of the latter is thought to prevail due to the fact that US personnel from the 102nd Coastal Artillery Battalion (AA) US Army trained some Australian gunners in the use of Anti-aircraft weapons in the Northern Territory early in 1942. US doctrine of the period gives the following dimensions for a light AA emplacement and states the following for a M2 .50 Caliber machine gun. 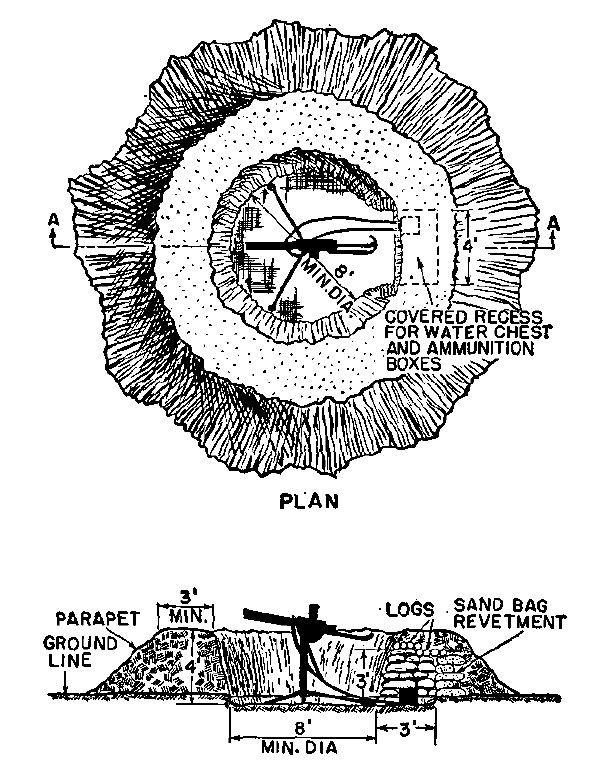 “[The emplacement] is a circular pit 8 feet in diameter and slightly less than 4 feet deep from the top of the parapet. There is an additional 3-foot excavation under the parapet on one side for water chest and ammunition“. Reference: FM5-15 CORPS OF ENGINEERS FIELD FORTIFICATIONS 14 FEBRUARY 1944 ENGINEERS FIELD FORTIFICATIONS WAR DEPARTMENT : 14 FEBRUARY, 1944 (Page 100-101) These dimensions regarding the diameter of most light AA emplacements is consistent with most LAA employing breastworks constructed of 44 gallon drum ‘gabions’. The depth of many of these emplacements however is hard to verify due to soil addition in the bottom of these positions over the last 70 years. 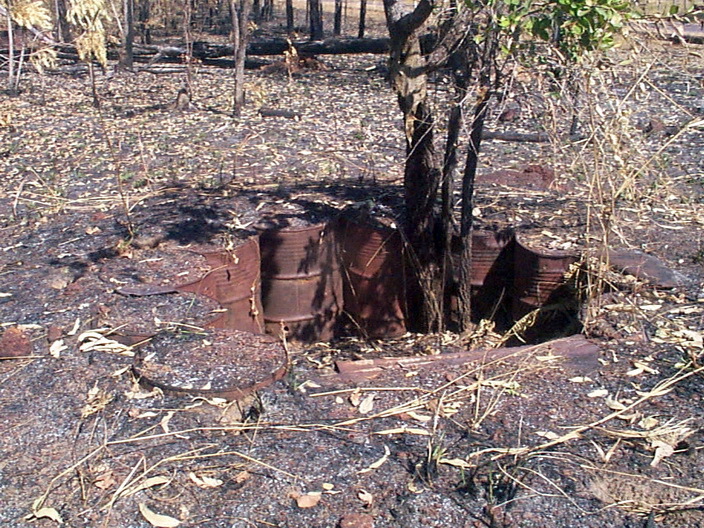 A typical LAA emplacement with breastworks constructed from 44 gallon drums with corrugated iron ramparts at Coomalie. 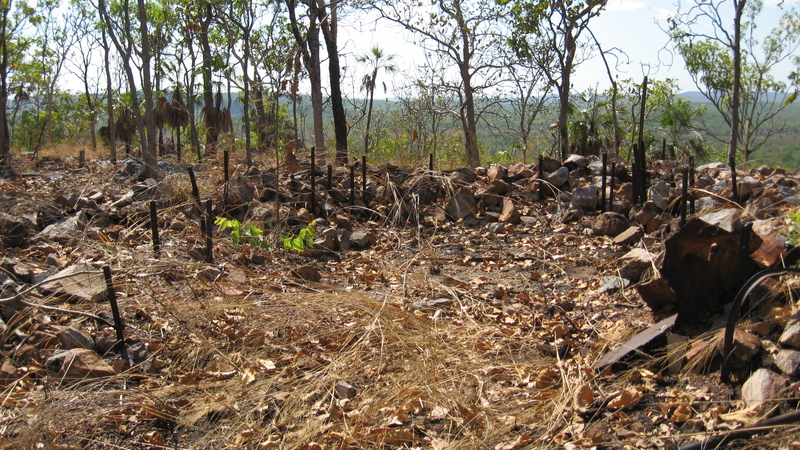 This particular emplacement has a double row of drums facing towards the intended direction of attack to provide for more protection from machine gun fire. 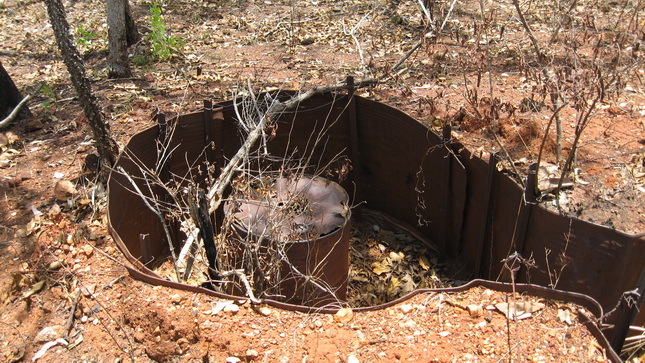 A small ammunition insert in the LAA emplacement. Note the corrugated iron roof for the insert. 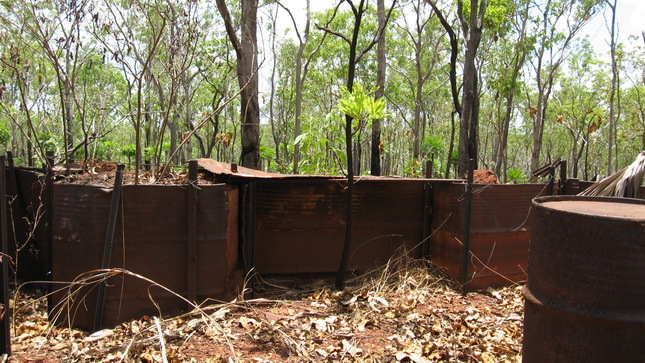 A LAA emplacement employing the ’44 gallon gabion’ as seen at Coomalie. NWA0027 – Copyright expired – public domain. A LAA emplacement opposite to Livingstone field (34 Mile). 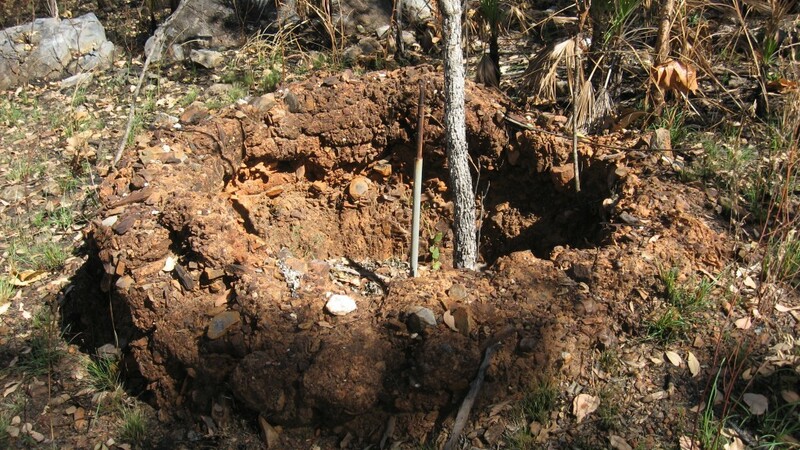 This particular emplacement has earth piled up evenly around its entire circumference in correct adherence to the US field manual on fortifications and is thought to have been constructed by members of the 102nd Coastal Artillery Battalion (AA) US Army. 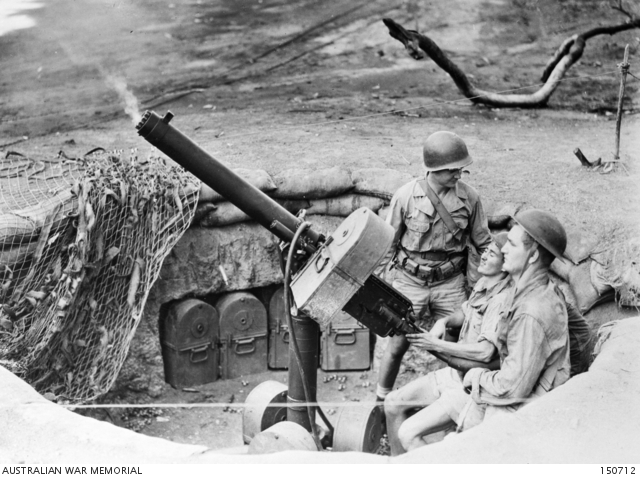 A soldier of the 102nd Coastal Artillery Battalion (AA) US Army, instructs two Australian soldiers on the use of Browning Machine gun. 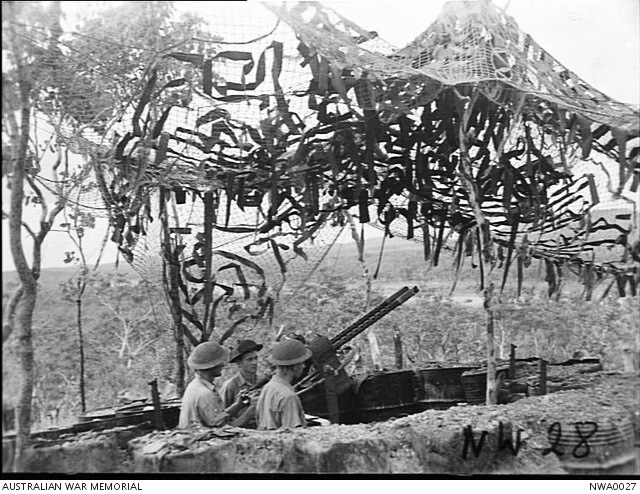 Cal .50 M2, Water-cooled Machine gun on an M2A1 mount at one of the roadside fighter strips between the 27 and 34 Mile pegs. It was this training that may explain the predominance of us army style AA emplacement layouts in the NT. Note the absence of 44 gallon gabion breastworks and earth piled up around the emplacement. NWA150712 – Copyright expired – public domain. Light machine gun positions were also constructed from local rock in a practice that seems to have been imported from veterans from the North African and Middle Eastern theaters. Photographic evidence suggests that the practice of using rocks for the construction of breastworks rather than use 44 gallon gabions was common amongst soldiers who had experience warfare in the desert where there was little else to use. A large stone LAA emplacement at 49 mile. 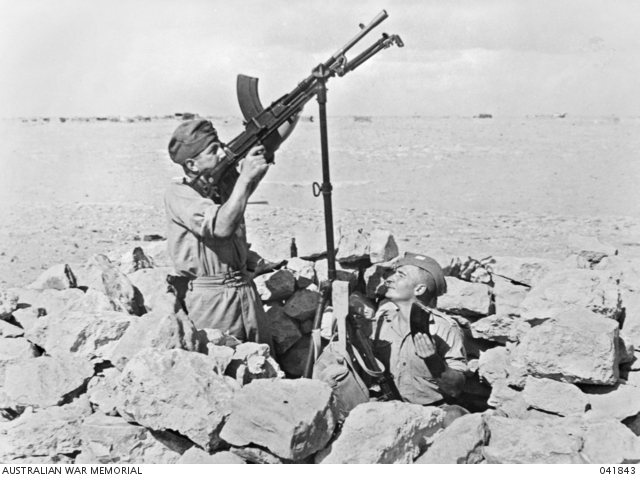 A photo taken of Australian soldiers in North Africa in 1941 in a very similar LAA emplacement to the one that can be found at 49 Mile indicating the importation of knowledge from other theaters of war. NWA006512 – Copyright expired – public domain. A small LAA emplacement at 49 mile on a ridge overlooking the main camp area. A very similar rock emplacement in North Africa. NWA041843 – Copyright expired – public domain. A LAA position thought to have been constructed from crushed anthills and mixed with cement at 51 Mile. 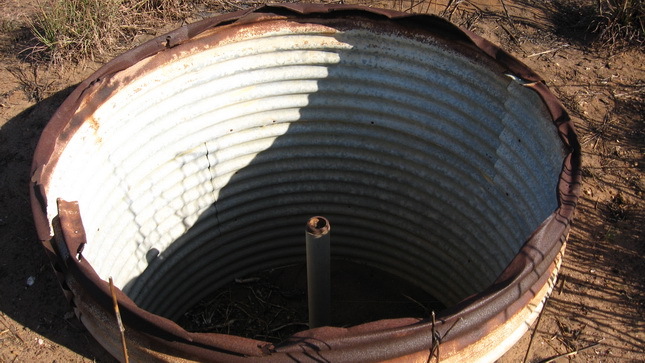 This particular example is the only such type seen by the author and was used to mount a Lewis MG.
A LAA emplacement, the breastwork of which has been constructed using a dug in corrugated iron water tank located at the West Point Battery. The pintle can be seen in the center and was used in this case to support a Lewis Machine Gun. 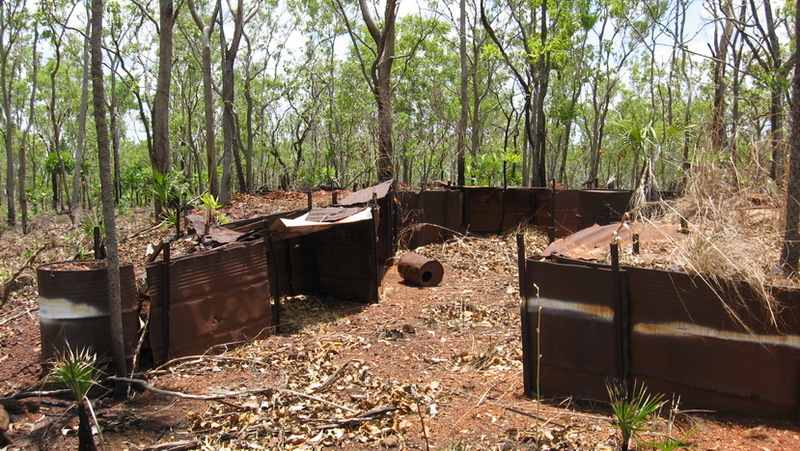 Such emplacements appear to have been popular in the fortress areas where water tanks of this type were easily salvageable from the township of Darwin. A historic photo of such an emplacement in action with a M2 Browning .50 Caliber Machine Gun located at its center. 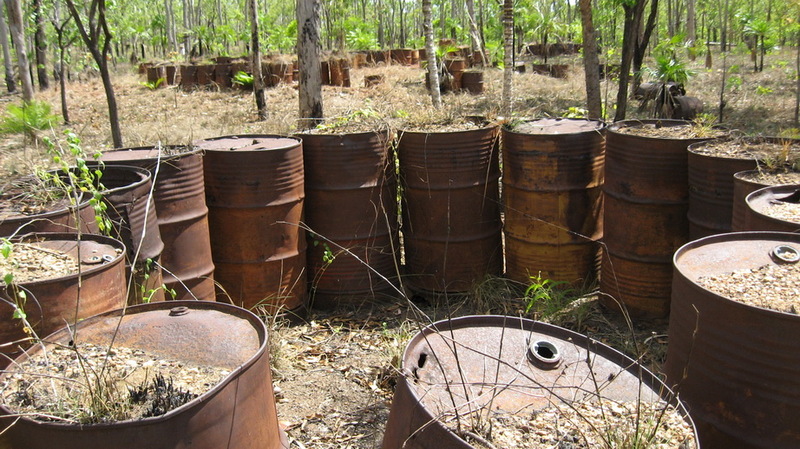 Note how the 44 gallon drum at right has been used as an improvised ammunition magazine. NWA052913 – Copyright expired – public domain. The remains of a very elaborate AA pintle also located at the West Point Battery, the emplacement having filled with earth. On both sides can be seen the supports for ammunition cans which would have fed the Vickers Machine Gun located on the center post. 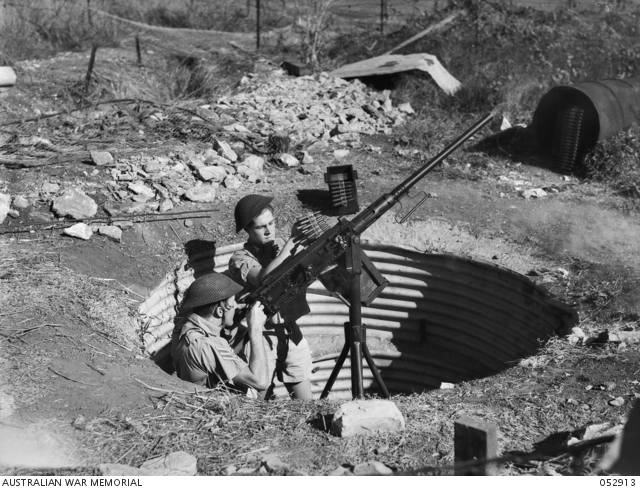 A similar LAA position with a Vickers Machine Gun at the center. Note the ammunition can on the right hand side of the gun. Argus Newspaper Collection of Photographs, State Library of Victoria. 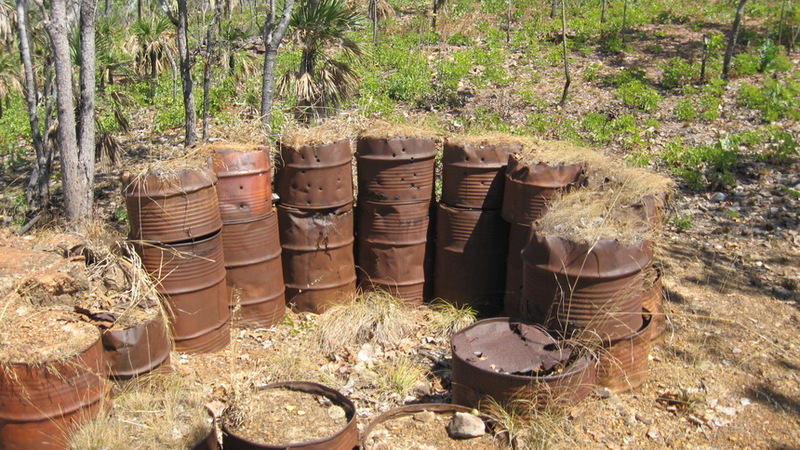 44 Gallon (55 US Gallon) drum use in AA emplacements: Although the specific use of 44 gallon drums to create breastworks does not appear in any of the field manuals, both Commonwealth or US, the ‘Field Engineering (All Arms) Military Training Pamphlet No. 30 Part V- Protective Works 1944‘ (pg. 24) lists ‘gabions’ as materials to be used when constructing breastworks. A ‘gabion’ according to the oxford dictionary is “a cylindrical basket or container filled with earth, stones, or other material and used in civil engineering works or (formerly) fortifications”. 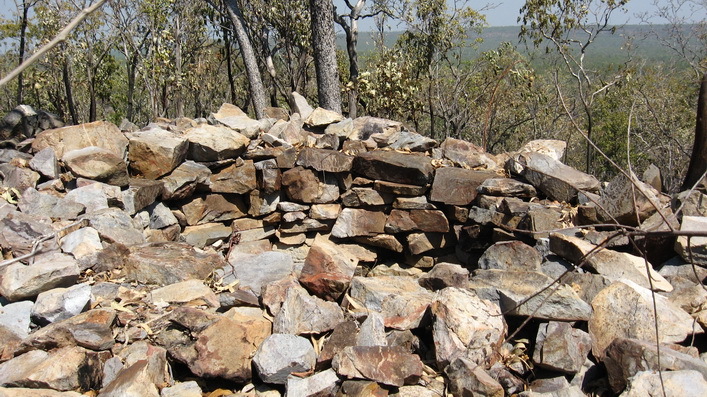 Gabions have been used in military fortifications since the medieval period, but they came to prominence during the Napoleonic, Crimean and American Civil Wars as a means of erecting quick fortifications. During the Napoleonic and Crimean wars, Gabions were used extensively as a means to emplace artillery pieces in redoubts and the like (see photo below). The protective and versatile qualities of gabions as a means to protect men and equipment are obvious insomuch as they could be easily positioned by hand in whatever defensive layout was required for the particular circumstance. 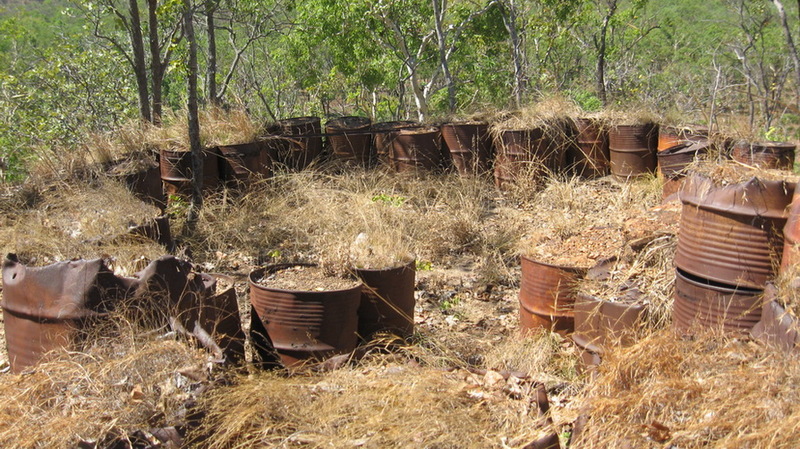 Granted the 44 gallon drum itself was not a true gabion as defined by military textbooks as it was constructed with steel rather than with brushwood, however it is undeniable that the drum itself was in many ways better suited to the conditions of warfare in the 20th century than the older type. The 44 gallon type gabion was also much better suited to environmental conditions in the Northern Territory when compared to other forms of breastwork like that of the sandbag. The sandbag itself, while proving to be quite adequate in North Africa and the Middle East where the environment was dry, was not well suited to the hot humid conditions of the NT, often resulting in the rotting of the hessian material and a general collapse of the emplacement. The steel gabion was therefore much more suited to ensuring the longevity of the emplacement in much harsher conditions found in the top end. 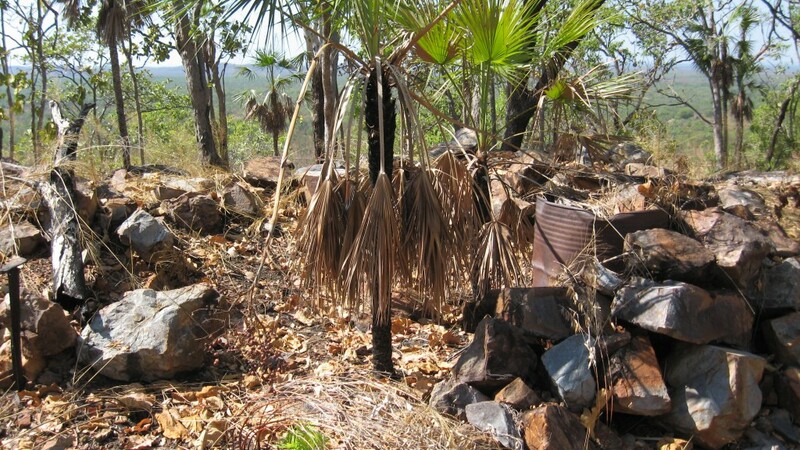 The humble gabion hence made a resurgence during the Second World War in the Northern Territory, in a role not to dissimilar to those used in the wars of the 19th century, that of em-placing artillery, and in this case anti-aircraft artillery. The ‘Field Engineering (All Arms) Military Training Pamphlet No. 30 Part V- Protective Works 1944‘ (pg. 23) gives an insight into the construction of a Gabion Type emplacement by stating that ...”they [the gabions] must be braced internally with wire to preserve their shape. Gabions are built up into a revetment at a batter of 4/1 and filled with earth. The foundation must be sloped as for a sandbag wall. 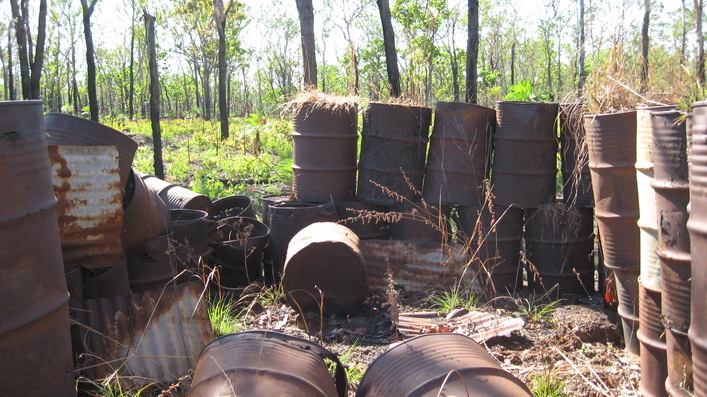 Empty oil drums, tins, and other receptacles can be used in a similar way”. 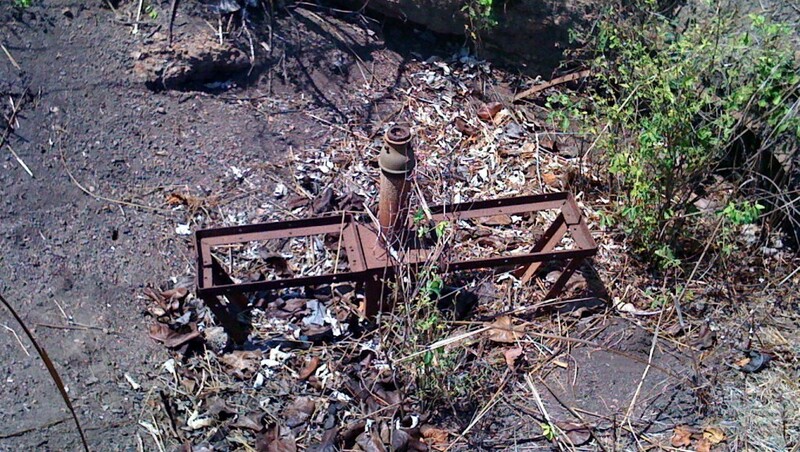 What is thought to be a searchlight or 40mm position near Jenkins Road. Note the similarities between this photo and historic photo above. As with LAA positions, 40mm emplacements can be found in large quantities, especially around airfields as these were considered to be high value targets with their ability to project offensive firepower over long distances. 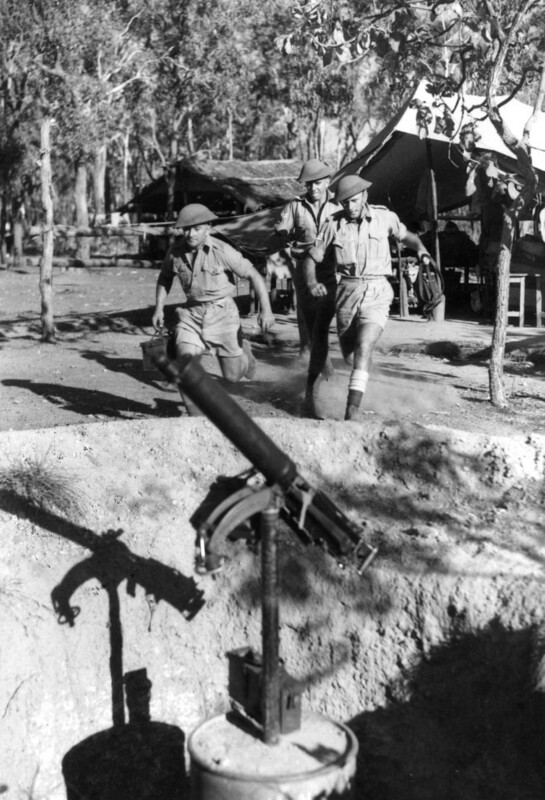 The ability of the 40mm bofors to engage and track aircraft and prosecute with a considerable and rapid quantity of firepower at low to medium altitudes made it an ideal choice to fend off strafing and ‘hit and run’ raiders. This ability made it of prime importance in the approaches and flanks of the threshold of the runway, and around aircraft dispersal areas. As such, many emplacements exist today and in a plethora of configurations, constructed to best suit the topography and the needs of defense. 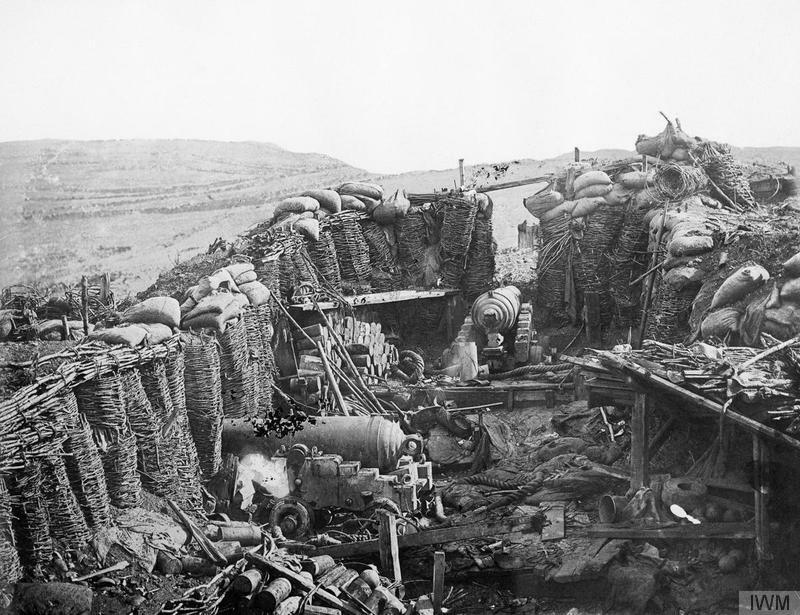 The general layout described above can be seen across the top end and exist in many adaptions of the basic principle with the emplacement for the gun constructed from 44 gallon drums serving as ‘gabions’ complete with ammunition niches on each side, and the director off to the flank or to the rear. 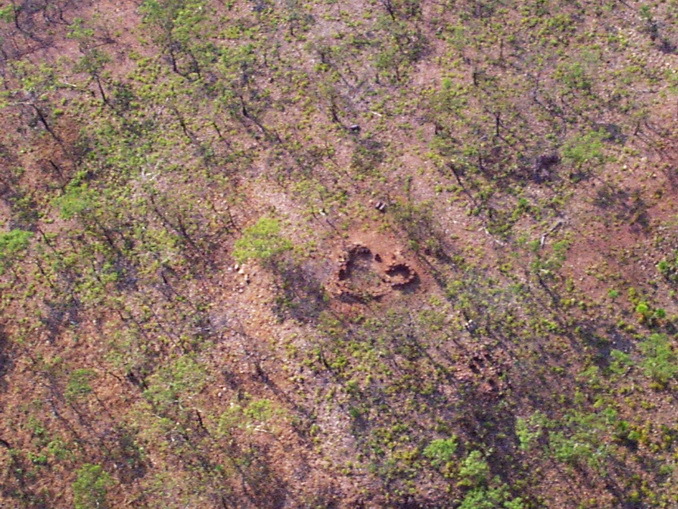 A photo of an AA emplacement from above showing the layout of a typical 40mm position with the remains of the emplacement for the gun at left and the position for the gun director at right in the small circle of 44 gallon gabions. 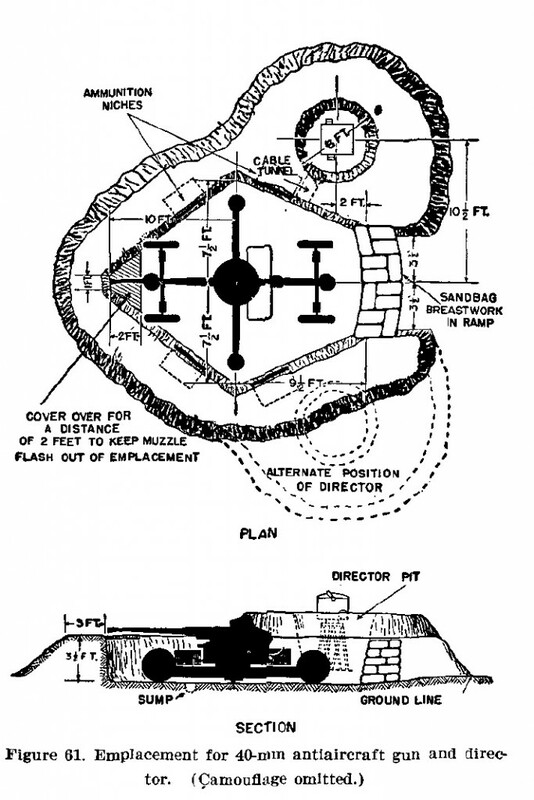 Often when the gun was removed at the end of hostilities the breastwork ramp (see diagram above) used to enclose the gun was demolished to extract the gun from the emplacement as can be seen in at the bottom of the photo. 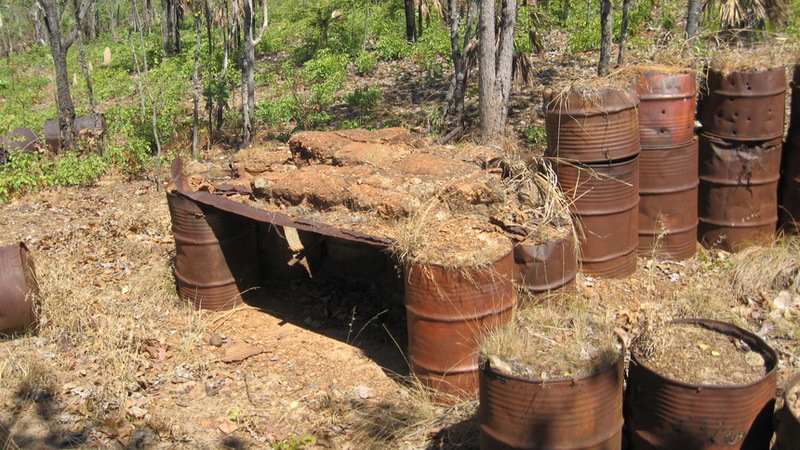 A 40mm emplacement at Gould with flattened 44 gallon drums instead of the gabion type which forms the breastwork. 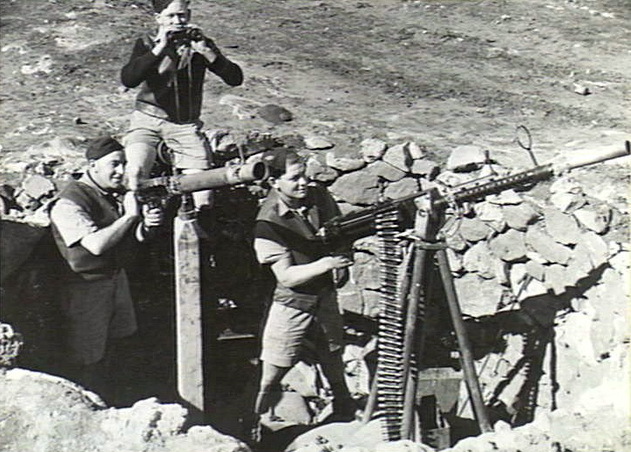 A 40mm ‘bofors’ gun crew at the ready in their emplacement. Note the cleared fields of fire in the background and the prefabricated camouflage netting resting on the 44 gallon ‘gabions’ behind. Note also that Australian censors have blanked out something in the center of the photo. Argus Newspaper Collection of Photographs, State Library of Victoria. 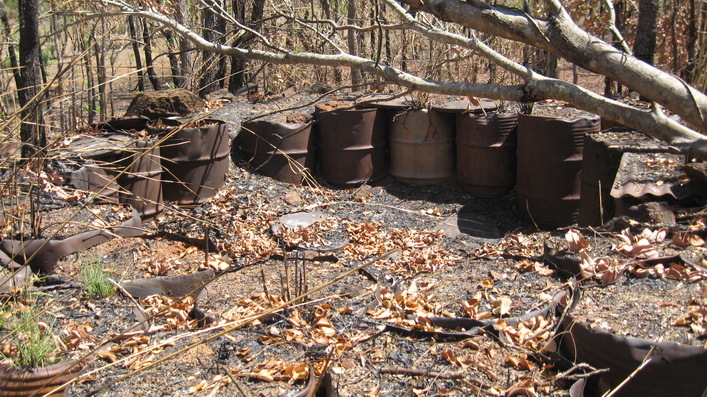 A director position located to one side of the emplacement using flattened 44 gallon drums. A director position using the 44 gallon ‘gabion’ style of construction. Another 40mm gun director position using local rock to form its protective works. An ammunition niche recessed into the side of a 40mm emplacement, Gould. 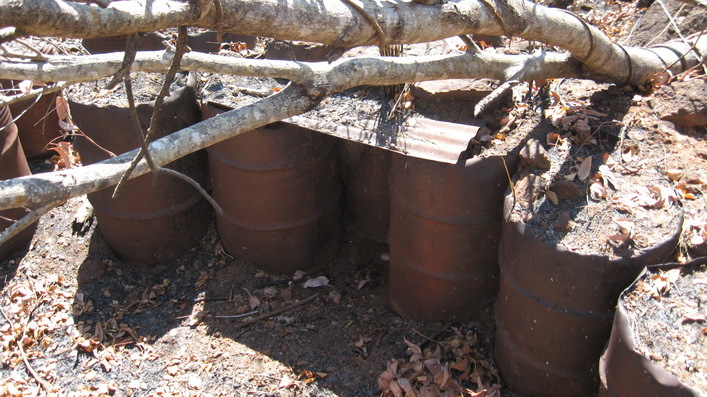 A covered stand alone ammunition niche constructed from 44 gallon drums. A sheet of corrugated iron and cement forms the protective roof.